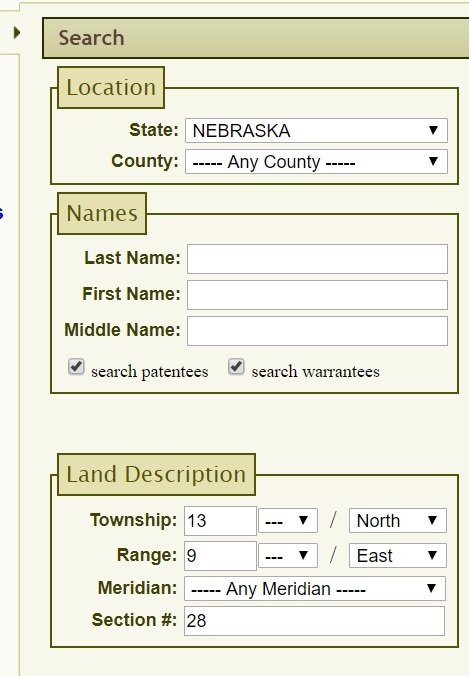 One of the nice things about the land patent search at the Bureau of Land Management (BLM) website is the ability to perform geographic searches based upon the location of the property that was patented. This can be a great way to search when the location of the property obtained from the federal government is known. of section 28 in township 13 North Range 9 East. Curious to see who else acquired property in that section, I searched the BLM site for that specific section. There was no entry for Eliza as shown in the results screen. 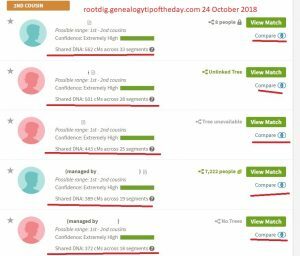 There were only five entries in the database for patents tagged to that section of property. Searches for Eliza R(h)amsey in the BLM database did not locate her patent (the only Eliza Ramsey was in Loup County in 1890–not the woman of interest). I don’t have an answer as to why Eliza R(h)amsey is not in the BLM database. She did receive a homestead. Just to clarify, I reviewed the BLM tract book for section 28 in the appropriate township. There was an entry for Eliza J. Rhamsey–just as expected. But I did notice a little oddity in the tract book that was also in the search results and which I originally overlooked. There are two entries for southeast quarter of the southwest quarter of section 28 (40 acres, more or less)–once to Milton Parker and once to William Webster. This could easily happen in the tract book–as it records both complete and incomplete claims. The right hand page indicated that both Parker and Webster’s claims were completed (also evidenced by their appearance in the BLM database). why does Eliza not appear in the BLM database? why is there property listed twice? These are interesting questions which I may not be able to answer. But, I’m trying to keep myself on track here. I located the homestead application in which I was interested. The other entries in section 28 do not appear to have any connection to Eliza (the last names at this point are not “familiar” and the dates don’t suggest a close connection (although William Webster’s date does suggest some act, regulation, or legal interpretation went into effect in the summer of 1864). I am making a note that occasionally the BLM database (like all databases) may contain omissions. I’m making a note about having noted the “duplicate” property entry. While that is interesting, I’m going to hold off on determining how that happened in the interest of time and because it doesn’t appear to have an immediate and direct bearing on my problem–Eliza Ramsey. My goals are to document her family–particularly her husband Harrison. If other sources do not provide information on him, I’ll revisit this land patent issue.